The market-leading legal compliance platform combining nearly 25 years of experience with forward-thinking innovation to provide convenience, simplicity and peace of mind. It assists you and your team to know all of your organisation’s legal and voluntary environmental, social and corporate governance obligations, and helps you ensure that these obligations are met, on an ongoing basis. In a sea of constantly changing legal requirements, find out what your legal obligations are and make sure you meet the obligations. With nearly 25 years of experience, we can assist you to conform to the requirements of international management standards, ensuring that your organisation passes external audits and continuously improves its management practice. 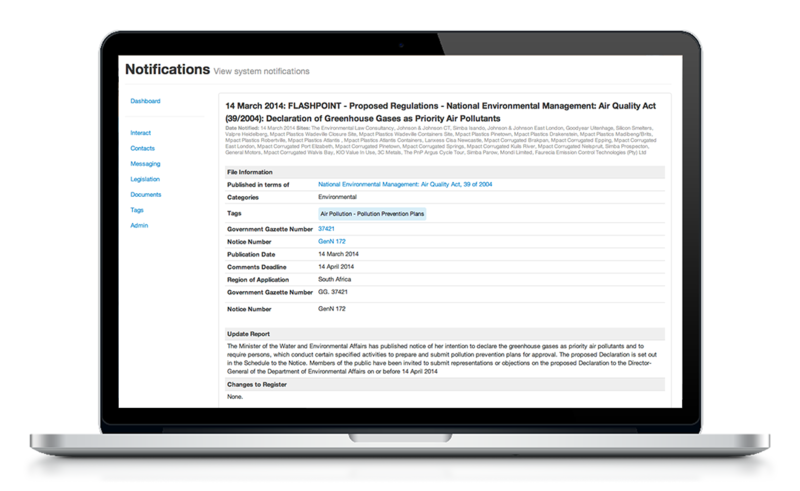 One dashboard of your environmental, social and corporate governance world, able to integrate multiple sites/operations and offer precise information about the obligations at each. 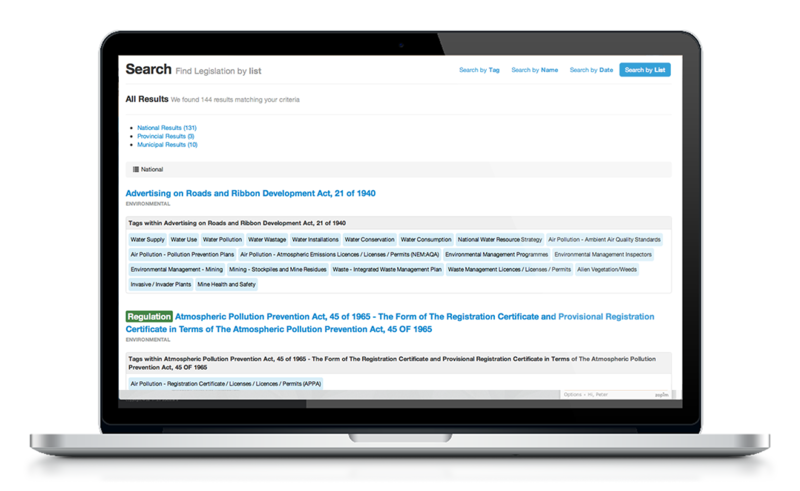 With all legal and other requirements categorised, tagged and logically organised, there are no less than four ways to search. Quickly and easily find precisely what you’re looking for. Currently, there are over 6,000 plain English summaries, 2,000 tags and 40,000 legal provisions meta tagged, with new data and meta data loaded every day. Staying up-to-date with, and understanding the ramifications of ever-changing legal and other obligations need not keep you up at night. Every morning, you’ll receive relevant updates and be notified, in simple-to-understand terms, as to how any applicable change may effect your organisation. 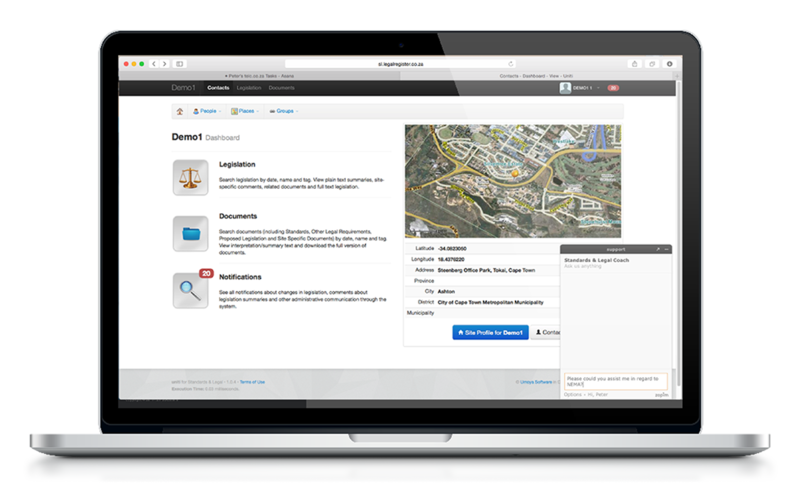 Operational risk and legal requirements integration, like never before. 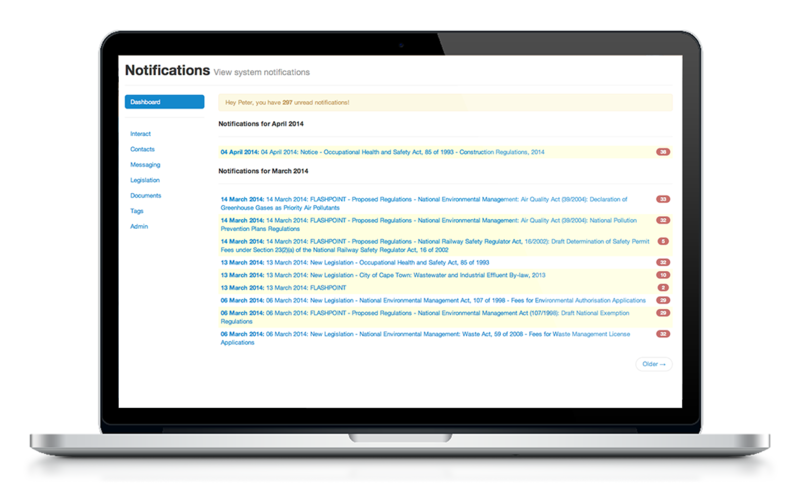 The Standards & Legal Platform ensures that all legislation and other legal requirements applicable to any particular risk item, is known and kept current on an ongoing basis. Despite our market-leading environmental, social and corporate governance (ESG) platform, we believe that technology and systems don’t improve ESG, people do. That’s why we offer the ongoing support through our multi-disciplined team of scientists, lawyers, systems-thinkers and technologists. Experienced in successful change management, we understand that too much change can be counter-productive. That’s why our platform is modular and able to incrementally transform the way you govern ESG. Committed for the long-term, we’ll remain a vital support to you long after initial implementation – ensuring effortless ESG, focused legal compliance and stress-free management systems, always. Our team is ready to assist you with the environmental, social and corporate governance (ESG) legal compliance and management standard obligations that your organisation currently faces.